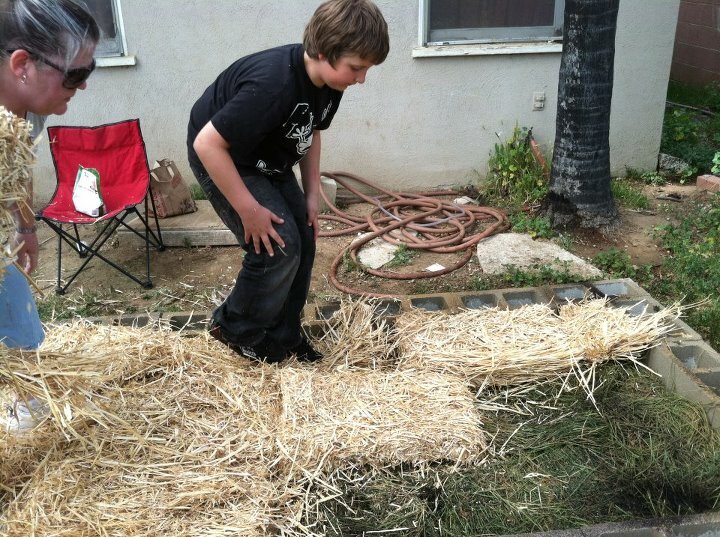 My niece, her children, and my husband and I built a no-till garden in her Cali back yard. She and I have been discussing doing this for years because a no-till garden was the perfect solution to her gardening dilemma of horrible hardpan soil in her back yard and her strong desire to garden. 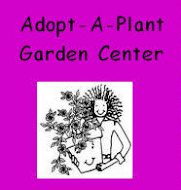 Gardening fits her in so many ways - her desire to grow sustainably and feed her family well, along with her profession which is botanist/environmental scientist. 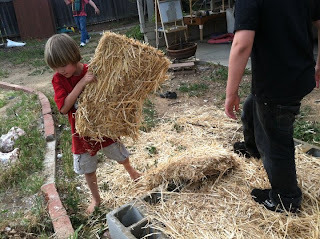 But, this was the first opportunity we've had to actually get our hands dirty together and get the job done. And, everyone got their hands dirty -- from the three year old to your's truly. The true no-till gardener is always perfectly accessorized! What I love about helping someone build a no-till bed -- especially one with back yard soil as lousy as Erika's -- is the way their opinion changes as the garden building process moves along. First comes puzzlement, because they don't quite get it but are willing to give it a try -- to final comprehension of the final result, mostly anyway. They always figured gardening was impossible given the quality of their particular soil, but now gardening it is a reality -- that's the best! 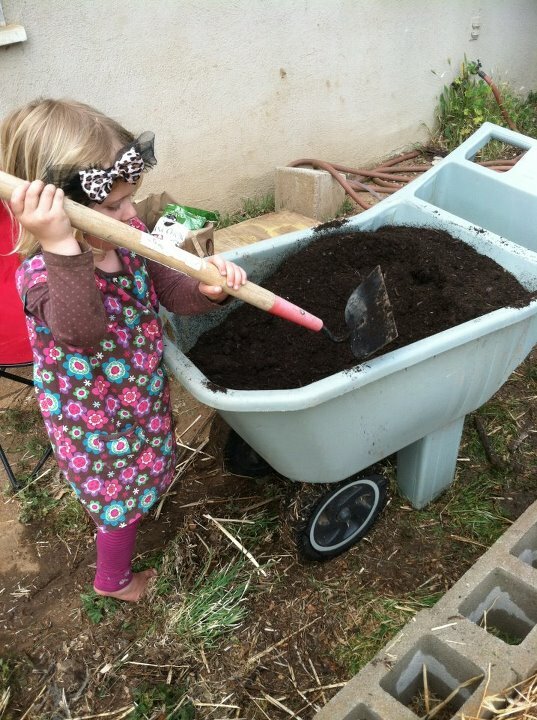 My niece has become just such a convert to the no-till gardening method. She wasn't quite convinced but very willing to try as we drove around looking for very expensive alfalfa ($16.95 a bale in sunny California verses free to $5 at home -- definitely a bit of sticker shock! 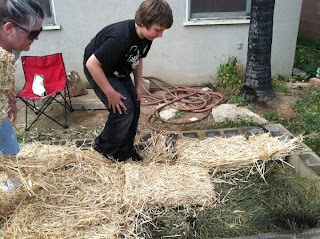 ), cinder blocks to contain her garden layers, etc. But, the no-till garden is a perfect application for California, where water availability is often an issue, especially for someone like my niece. She is an environmentalist and works very hard to live in an environmentally conscious way. The fact that these gardens retain water so well is definitely a plus in water strapped California. Ta Da! Ready for planting and watching the garden grow and grow and grow. The best part was how excited my great niece and nephews were to pitch in and help us build the garden. 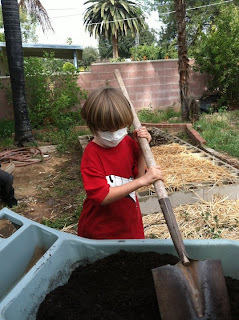 They were little gardeners getting dirt under their fingernails and we had the best time. 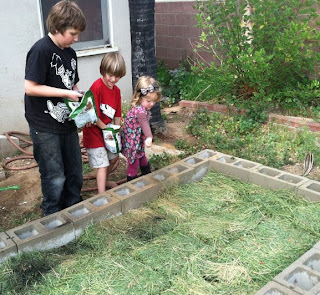 They can't wait to help mom plant that garden and I can't wait to get regular updates as to the California No-till Garden's (and new no-till gardener's) progress. I'll keep you posted! ** I strongly recommend painting the cinder blocks, particularly on the bed-facing side, to create a moisture barrier. Use low/no VOC paint. 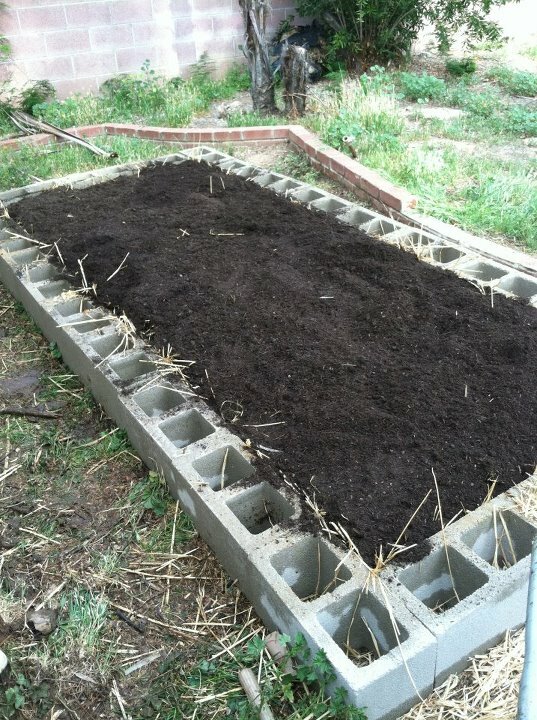 If you don't seal the blocks this way, they will wick away the moisture from your garden.